Look at Tom Hanks’ résumé and you’ll find that he has appeared in 18 movies that earned $100 million or more. Examine Steven Spielberg’s body of work and you’ll discover 15 flicks that took in $100 million or more. When they worked together in 1998’s Saving Private Ryan, the result yanked in $216 million. 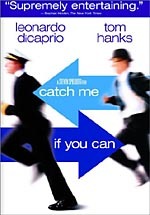 Their partnership in 2002’s Catch Me If You Can brought in $164 million. Actually, for a quiet comedy/drama about a guy stuck in an airport, that’s a pretty good gross. It’s simply the expectations that came with a Hanks/Spielberg partnership that made it look lackluster. While not among the best efforts by any of those involved, The Terminal presents a consistently amusing and entertaining piece of work. At the start of the flick, we meet Viktor Navorski (Tom Hanks), a citizen of the (fictitious) Eastern European country Krakozhia. We soon learn that a military coup occurred there while he was en route to New York, and the US government does not yet recognize the new leadership. JFK Airport Customs Director Frank Dixon (Stanley Tucci) tries to explain to Viktor - who speaks virtually no English - that he’s currently a “citizen of nowhere” and can’t leave airport property until some form of diplomatic recognition takes place. This restricts Viktor to the international travel lounge, where he tries to make the best of things. Dixon claims this matter should be resolved soon, but no quick fix occurs. Before long, Viktor’s presence irritates Dixon; he wants the displaced foreigner to leave the airport so he’ll become someone else’s problem. Viktor steadfastly refuses to break the rules and he remains at JFK. Another major thread opens when Viktor meets flight attendant Amelia Warren (Zeta-Jones). The two occasionally bump into each other, and some minor romantic sparks develop, though these are complicated since Amelia dates a married man. 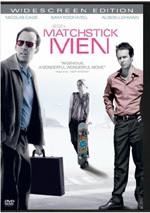 The film follows all of Viktor’s various interpersonal relationships as well as Dixon’s attempts to rid himself of his burden. Despite some flaws, I like The Terminal. It gets tiresome toward the end and threatens never to conclude, and inconsistent storytelling renders it less involving than I’d like. Nonetheless, it presents a clever premise with some amusing situations and good performances. It’s nothing special but it remains enjoyable. 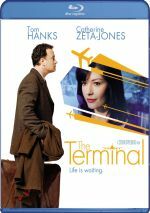 The Terminal appears in an aspect ratio of approximately 1.85:1 on this Blu-ray Disc. I felt pleased with this consistently appealing transfer. Sharpness worked fine. Little to no softness materialized throughout the film, as the image remained accurate and concise virtually the whole time. Jagged edges and shimmering created no concerns, and edge haloes failed to mar the presentation. As for print flaws, the movie seemed clean. Terminal presented a stylized palette, as a lot of the film came in shades of green, yellow and blue to match the airport interiors. These colors weren’t all that attractive, but they showed appropriate delineation for the movie’s goals. Black levels came across as accep deep and dense while shadow detail appeared smooth and clear. This was a strong representation of the source. I felt the DTS-HD MA 5.1 soundtrack displayed a pretty heavy emphasis toward the front speakers. Those channels offered solid stereo presentation for music and also spread out effects well. Mostly the set tended toward general ambience that reflected the situations. It came to life more significantly during a smattering of louder sequences, especially when aircraft became involved. Not a lot happened in the surrounds, but they added a decent feeling of place to the film. Audio quality appeared good. Speech came across as natural and distinct, as I noticed no problems related to intelligibility or edginess. Music demonstrated good bounce and smoothness, and also showed nice dynamics. Effects were accurate and detailed, and they also displayed fine bass response; low-end was rich and tight. Ultimately, the audio of The Terminal didn’t do much to impress, but it worked fine for the material. How did the Blu-ray compare to the original 2004 DVD? Audio showed a bit more dimensionality and range, and the picture delivered a nice step up. The Blu-ray looked significantly tighter and smoother than the DVD. Even for 2004 DVD standards, that release didn’t offer terrific visuals, so I was pleasantly surprised by the Blu-ray’s improvements. The majority of the DVD’s extras repeat here, and most of the information comes to us via a series of six featurettes. We start with the eight-minute, six-second Booking the Flight: The Script, The Story. It and its successors use movie clips, behind the scenes elements, and interviews. We hear from director Steven Spielberg, writers Jeff Nathanson and Sacha Gervasi, and producers Walter F. Parkes and Laurie MacDonald. We find out what attracted Spielberg to the project, research, themes of the story, and its themes. Despite some interesting moments, the featurette feels a bit too superficial to offer a great look at the subjects. After this comes Waiting for the Flight: Building The Terminal. It fills 12 minutes and 19 seconds as we hear from Spielberg and production designer Alex McDowell. They discuss the design and construction of the movie’s enormous airport set. Aided by many good shots of the location, this piece gives us a fine look at the subject. We get a nice tour of the set and find out many of its inspirations. Now we head to Boarding: The People of The Terminal. This piece splits into three smaller programs: “Tom Hanks Is ‘Viktor’” (7:38), “Catherine Zeta-Jones Is ‘Amelia’” (8:40), and “Viktor’s World” (15:29). We find notes from Spielberg, Hanks, Zeta-Jones, Stanley Tucci, Barry Shabaka Henley, Diego Luna, Zoë Saldana, Kumar Pallana, and Chi McBride. They discuss their characters and their approaches to the roles. Some good notes pop up, especially when we hear about the casting of Zeta-Jones, but a lot of the time we just get basic character descriptions. These reiterate information we already know from the movie and make “People” only sporadically useful. Up next we get Take Off: Making The Terminal, a 17-minute and 13-second program. It presents information from Spielberg, Hanks, Zeta-Jones, Parkes, Henley, Gervasi, McDowell, Tucci, Luna, director of photography Janusz Kaminski, costume designer Mary Zophres, and executive producer Patricia Whitcher. We learn about photography and color design, costumes, visual effects, and the movie’s pacing. Like all the other programs, this one suffers from a generally fluffy tone; there’s lots of happy talk. Nonetheless, it tosses out a fair amount of compelling material about some of the elements. It’s not great, but it’s moderately useful. During five-minute and 53-second In Flight Service: The Music of The Terminal, we find notes from Spielberg and composer John Williams. They chat about the movie’s score and what was intended with its themes. Williams elaborates well on his influences and goals in this tight program. For the final featurette, we get Landing: Airport Stories. It goes for five minutes and 41 seconds with information from Spielberg, Zeta-Jones, McDowell, Kaminski, Williams, and Hanks. They chat about unusual airport experiences, or the lack thereof in the case of Spielberg, who states he never had anything out of the ordinary occur. It’s a decent little piece, though none of the stories are terribly compelling. In addition to two trailers, we get a Photo Gallery we see 59 shots from the set and the film. It’s a bland collection of pictures. At this point in his career, I don’t know if Steven Spielberg has it in him to make a truly great movie. The Terminal stands as a representative of the modern Spielberg: it has enough charms to make it enjoyable, but it shows too many problems to rise above “pretty good” status. The Blu-ray delivers excellent visuals, positive audio and an informative set of supplements. This becomes a quality release for a light but entertaining film.